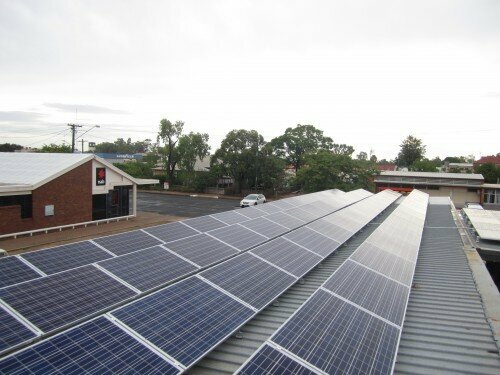 50kW is one of the most popular solar system sizes for commercial solar applications in Australia. Any business owner can attest that grid electricity prices have risen dramatically in the past few years, and many are now turning towards solar power as a way to reduce their bill. This article takes a look at pricing, energy yields the factors that influence returns for 50kW solar systems in Australia. Solar power system prices have fallen dramatically in Australia in the last few years, and more and more businesses are adopting solar PV as a practical way to reduce their operational overheads. Thanks to falling costs, solar is now unquestionably a cost-effective way for businesses to generate clean electricity, which is why it has become such a popular option. 50kW solar systems benefit from economies of scale, and are often less expensive per watt of installed capacity than smaller systems. In the name of bringing transparency to Australia’s commercial solar market, Solar Choice tracks monthly pricing trends for popular system sizes (10kW, 30kW, 50kW and 100kW) across Australia’s capital cities in our Commercial Solar PV Price Index. You can see the most recent pricing data here. To get the most current and relevant pricing, however, we recommend that you fill out the Commercial Solar Quote Comparison form to the right of this page. By doing so, you’ll be able to see quotes from a range of installers who operate in your area. Our team will also develop a solar business case customised to your energy bills – and even advise you about alternative solar system size options. A number of factors could influence the actual output of a 50kW solar system (or any size of solar system). These include the system’s geographical location, the orientation and tilt angle of the solar panels, the presence or absence of shading, the operating temperature of the panels and inverter, and the performance of the components used in the system. The maximum hypothetical yield of a solar PV system is determined first by the amount of incident sunlight that it will see in the course of a day, month, year, etc. Different regions of Australia receive different amounts of sunshine depending on their latitude and climate. As a rule of thumb, however, a 50kW solar system in Australia can be expected to produce around 4 kilowatt-hours (kWh) per kW of installed capacity per day, averaged throughout the year. This would work out to a total of about 200kWh of solar energy per day for your business. Keep in mind that this figure will fluctuate depending on the system’s location (Brisbane tends to see much more sunshine than Hobart, for example) and the time of year (system output is usually higher in the summer time thanks to the longer days). Solar choice has helped a multitude of Clubs and Pubs across the nation look into their solar potential. Much as with system output, the return on investment (ROI) for a 50kW solar PV system will depend on a number of factors. The most important factors are 1) the up-front and ongoing costs of the system, 2) the price of electricity from the grid, 3) how the system is paid for or financed, and 4) the rate paid for excess solar energy fed into the grid or to a 3rd party. 1) The long-term investment-worthiness of a solar PV system will depend greatly on its construction costs and the ongoing costs of its operation (which are relatively minimal). It is key to check into the various options available, not only to compare prices but also to compare the components used and the expertise of the companies who could potentially do the job. Solar systems have a minimum expected lifespan of 25 years; any unforeseen issues with the system’s hardware can be costly and ultimately drive down its longer-term financial benefit. 2) The higher the electricity bill, the more a solar PV system can help. After installing a system, a business will have its own power station on-site and will accordingly benefit from a significantly reduced need to purchase power from the electricity grid, which will translate into smaller power bills. 3) Financing can play a major role in making the process of going solar economically viable for a business. Solar Choice Commercial offers a unique commercial solar PV financing package that enables the right clients to set up a solar farm or other large-scale installation with no capital expenditure, among other benefits. Learn more about Solar Choice’s Commercial Finance Package. 4) Although most business cases are built up on the assumption that all power produced will be consumed by the system owner on-site, it may in some cases be possible for the client to receive payment for the power that they export to the electrical grid through a feed-in tariff incentive scheme, or by selling it to a 3rd party with whom there is a power purchase agreement (PPA). If you are thinking about investing in a 50kW solar PV system – or any size system – for your business, you can initiate a dialogue with our commercial team at any time by filling out the Quote Comparison Request form to the right of this page (click the ‘Commercial’ tab). We wouldn’t be the best resource for that information as we operate only in Australia and this article is aimed at Australian end customers – not wholesalers or importers. Perhaps you could look into contacting an American company? Next post: What happens to old Solar Panels?